Patience has many meanings. 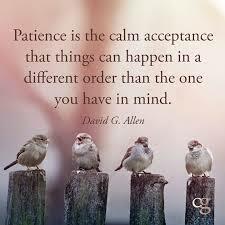 But those who know patience, know that it means having the capacity to accept delay for what it is. Tolerance for not knowing what is next, can be excruciating, but life is like that! Everything happens for a reason and when there are obstructions to our plans, this is no exception. What if the ‘wait’ time is a gift to offer us more time? Perhaps additional intervals, extra stretches of moments that we experience when we are waiting for something to happen, are because the Universe knows there is a better plan in place. We have all been known to take a wrong turn or two on our path through life. There is nothing bad about that, because when we do it gives us an opportunity to grow and learn. At least that’s what’s suppose to happen. I suppose when we end up in a place that is not meant for us, it could be because we made that decision from the emotional place of where we were at that time. That place in us that hasn’t fully expanded yet. We are forever elevating and evolving, because there will always be bumps on the road that we trek. Each bump or pot hole represents an opportunity for us to progress to a higher vibration of energy. The higher our vibration, the less bumps we have to overcome and the more we move towards what and where we are meant to be. What tends to be beautiful is, if we are trusting and patient enough to listen to our intuitive (our gut feelings) during that ‘extra’ time we have been given, we can avoid coming to a crossroad when we have to make a decision. Although nothing is ever a ‘wrong’ decision. You are always where you are because that is where you are meant to be. I can’t help thinking though that if there are delays in plans and obstacles get in the way of decisions – it is for a very good reason. You have to trust your intuition, if you want to be where are are suppose to be, and not where you are headed. Soul Work is hard work, it takes courage, faith, trust and a whole lot of patience. Becoming Soul Conscious happens when you step out of your comfort zone, there are a lot of people that might say your crazy. Good, because crazy is the new trend these days, for those of us that don’t give a darn about what any one else thinks.